The December skies of Athens are not without holiday cheer. Thanksgiving has come and gone, but unfortunately for Bobcats, classes have not. The reality of semesters at Ohio University is officially setting in, and along with the stresses of group projects and final exams comes the pressure of holiday shopping. Each year, my best friends and I exchange gifts. Although our “Santas” are no longer secret, we have been carrying strong the tradition of drawing names and frantically shopping for more than seven years now. As I pulled into Athens after my much-too-short Thanksgiving break, I realized that I would most likely not have the chance to leave the city again until after finals end. In turn, I realized that I would need to do most of my holiday shopping locally. For me, this is familiar scenario. Growing up in Athens, my family and I traveled to Parkersburg or Lancaster (if not Columbus) for most of our big-ticket items. We shopped locally whenever possible. Because those shopping destinations are at least 45 minutes away, I know that I won’t be able to make the trip this December. And, I expect I won’t be the only Bobcat with that problem. Fortunately, Athens has a great shopping scene! For those unfamiliar with the Court Street options, here are the best places to buy your holiday gifts. For all of your favorite Bobcats and athletes, visit The House, the first collegiate Under Armour store in the nation. Although gear might be pricey, items are Under Armour brand, which means it will be easy to match sizes and ensure quality. Located on the corners of State and Court, Artifacts offers it all – from clothes and jewelry to post cards and coffee mugs. It also has a wide selection of humorous shirts and toys. I highly recommend the store if you’re looking for a gag gift or a gift that will bring a smile to someone’s face. Perhaps better know for its selection of pipes, The Import House offers much more. Stop in to peruse the candles, bumper stickers, bags and most importantly, shoes. Nearly half the store is dedicated to shoes! The Import House carries Minnetonka shoes, including the moccasins that are much-beloved by my roommates and I. Although it is only open three days a week, Court Street Collections is your go-to place for local gifts. From jewelry, to drinking glasses to household decorations, you can find a beautifully, hand-made gift. The store is open Thursday, Friday and Saturday from 12:30 p.m. to 5 p.m., so be sure to stop by before its too late. If you’re struggling to think of a gift for someone, a Passionworks flower is my favorite gift suggestions. Passionworks collaborates with ATCO to help disabled adults create art and earn a living. You have probably seen one of their metal flowers on campus or throughout the community. Nothing says “Athens” like one of these flowers. Not only are they beautiful decoration pieces, they also represent an incredible cause. In addition to these stores, be sure to check out: The Fig Leaf, The Recycled Wardrobe, Mountain Laurel Gifts, The College Bookstore, Follett’s Bookstore, Little Professor, Cross Court, Betty’s Vintage Boutique, Athens Underground and the Twilight Boutique. I highly recommend you stroll down Court Street this Saturday afternoon and challenge yourself to stop into every single store! This weekend, I am definitely planning to visit Passionworks and Little Professor. Even if you do have time to leave Athens and shop elsewhere, I HIGHLY encourage you to shop locally! 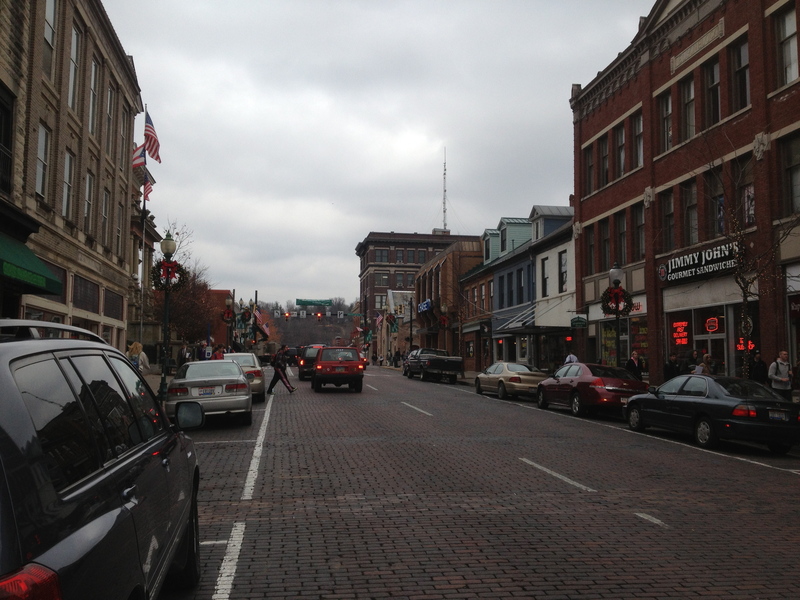 What are your favorite places to shop on Court Street? Did I miss one of your favorites? 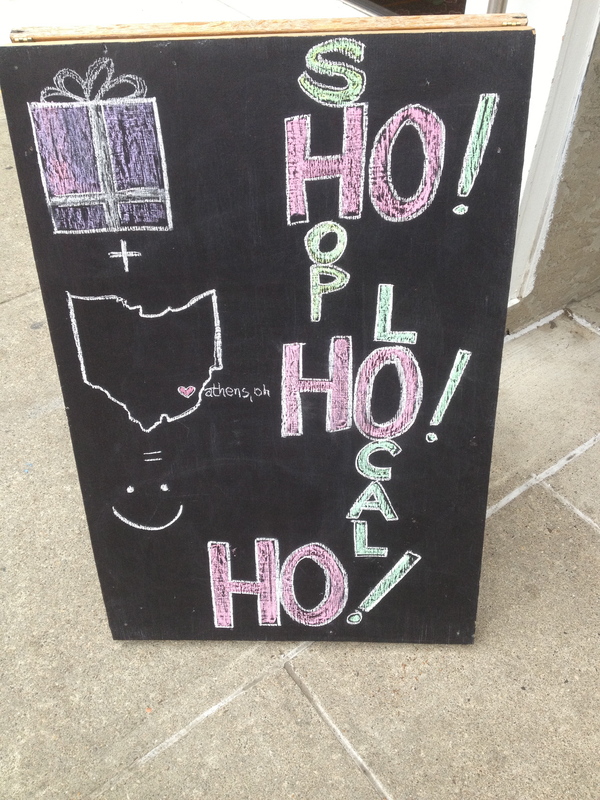 This sign outside of The Import House encourages you to shop locally.